The 2015 Summer-of-Two-Releases Virtual Tour winds up a busy week with appearances at the blogs of two of my writing friends. A.M. Dellamonica, author of Blue Magic, Indigo Springs, and Child of a Hidden Sea, interviews me about Dead Man’s Reach, His Father’s Eyes, and the challenges of writing under two names in two series for two publishers. You can find the interview here. And Harry Connolly, author of Child of Fire and The Way Into Chaos, is hosting me for a post about the ways in which we writers define success. That’s a more complicated issue than some might imagine, in an industry that imposes its own definitions of what it means to succeed or fail. You can read the post here. I hope you enjoy both the interview and the post, and I wish you all a wonderful weekend. 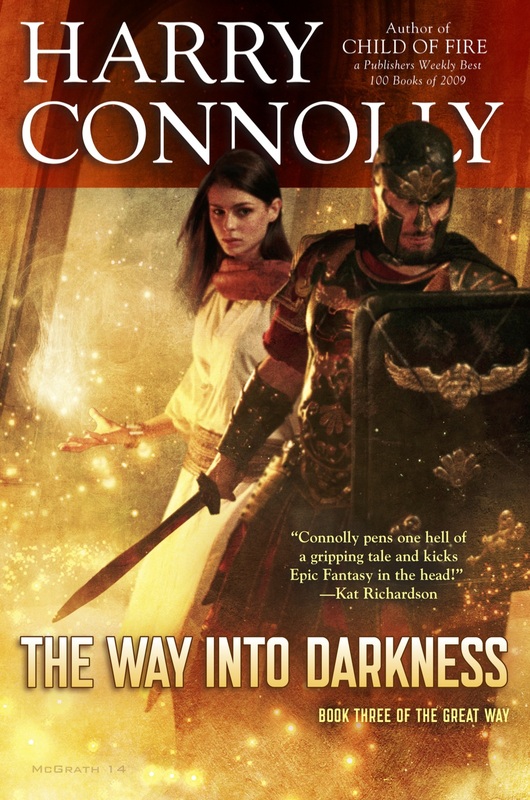 Today, I welcome author Harry Connolly to my site for a guest post about writing, publishing, and the power of perseverance. Good to see you here, Harry! So, I wrote a series and it flopped commercially. Twenty Palaces, the series was called. Del Rey was the publisher. I was a noob who got to work with their amazing editor-in-chief, Betsy Mitchell, and my covers were done by Chris McGrath. I saw my books in bookstores (even better, my in-laws saw them), plus reviews in Publishers Weekly, the whole thing. Honestly, it was a dream come true. … right up to the point where sales were amazingly mediocre, then became less mediocre with each book, and then finally sorry, we can’t publish any more of these books oh sorry no we will not be exercising the option on something else. It was three books and out for me. Obviously, it was time to move on to other projects. Again. The only problem was that the other times I’d moved on was because I couldn’t get something published. Now I had; I’d even found a small fan base. It wasn’t enough to sustain Del Rey’s interest in Twenty Palaces, but it was still a whole bunch of people. And they had my email address. I’d discovered a new kind of rejection. Suddenly, I wasn’t operating in total obscurity any more. I certainly hadn’t become famous, but I did have readers contacting me to tell me they loved my work. That’s an amazing thing, and I love when it happens. I love hearing from readers. But what those readers wanted was more Twenty Palaces, and I wasn’t sure I wanted to give it to them. Each Twenty Palaces novel sold about two-thirds of what the previous book had sold. I did not want to chase a shrinking readership. Could I have made some money self-publishing? Absolutely. Would it be a viable long-term career? I wasn’t so sure. So I wrote a post about the end of the series, and why I probably wouldn’t be returning to it for a long time, if at all. Then I sat down to figure out how I was going to create something new that my current readers would enjoy but that would also draw in new readers. I knew I was going to write an epic fantasy. I knew it was going to be full of action but not nearly as dark as the current fashion. But how was I going to keep the old readers while bringing in new? I needed to figure out what the fans had loved and what the non-fans had hated. To do that, I did something many writers advise that we should never do: I read my reviews. As far as I can tell, more authors avoid their reviews than read them, and this isn’t really the place to go into all the reasons why. Let’s just say they can be upsetting. Me, I grew up in a household where we said horrible things to each other all the time. We called it “joking.” So when a reader writes something like “The villain is a child-killing monster and he’s still more likable than the protagonists,” my first instinct is to laugh aloud. Online reviews are where you find the most honest appraisals of a book, because they’re not concerned with the author at all. They aren’t giving notes. They aren’t trying to encourage anyone. They’re speaking directly to other readers, saying “Here’s why you will love/hate this book.” So what did I learn? That was the list of things to keep. Once glance told me this was not a list of things to ditch. Frankly, I like action thrillers and fight scenes, so I had no plans to leave out the violence. Not every reader can be won over, and it would be self-defeating to try. Taking out the secrets, though? That I could do. It meant creating a story where none of the characters were in a superior position, and where no one was invested in hiding information. To me, that suggested a common enemy introduced to the setting for the first time. Also, by taking out the secrets, I gave the characters a chance to come together and discuss their situation. That slowed the pace for readers who felt things were too frenetic, and it provided a chance to portray a larger context. The real question is whether any of this truly matters. The Great Way turned out to be over 374K words long, and even if you don’t count individual words, it’s full of thousands of creative choices, large and small. On one hand, you have something as overarching as the concept: “a sentient curse causes the collapse of an empire.” On the other, you have choices as small as a line of dialog, or a name for a walk-on character. Amidst all those decisions, what difference does the choice between, say, mysteries and secrets make? I think it’s a powerful difference. We’ve all had the experience of reading a wonderful book that felt just a little “off.” Maybe it was the names, or maybe it was a character who didn’t seem quite real enough. At a certain level, if almost everything is great, those few shortcomings can dampen the readers’ enthusiasm. The trick is to understand why, and it was impossible for me to do that on my own. I had to venture out into reader-review land, where people called me a hack or thought I was ridiculous. That was where I found the answers I needed. If you’re wondering whether this new trilogy actually works, you can always see for yourself. The story is described in greater detail here, and I have sample chapters on my blog. Finally, I’d like to express my gratitude to everyone who takes the trouble to review a writer’s work in a thoughtful, intelligent way, even if they’re also being mean or snarky. All those opinions were valuable to me, and I could never have made this journey on my own. Thank you. BIO: Harry Connolly’s debut novel, Child Of Fire, was named to Publishers Weekly’s Best 100 Novels of 2009. For his epic fantasy series The Great Way, he turned to Kickstarter; currently, it’s the ninth-most-funded Fiction campaign ever. Book one of The Great Way, The Way Into Chaos was published in December, 2014. Book two, The Way Into Magic, was published in January, 2015. The third and final book, The Way Into Darkness, was released on February 3rd, 2015. Harry lives in Seattle with his beloved wife, beloved son, and beloved library system.